Who doesn’t love cake? Sweet, moist, delicious – a piece (or two) of cake makes the perfect final touch to a great meal – or a great late night snack! And a homemade, made-from-scratch cake? Divine. But not everyone has the time or skill for homemade cakes. If only we had our own personal bakery chef…. 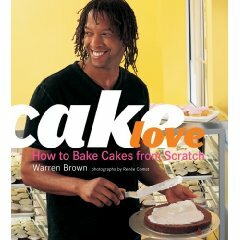 Warren Brown comes to the rescue with Cake Love, demonstrating the how and why of baking a cake (the best ingredients, the essential skills, the most useful pieces of equipment) and then provides lots of inspiration. Baking a cake from scratch isn’t really very difficult and can become a canvas for a lot of creativity. Brown encourages experimenting with flavors and techniques and to not get hung up on perfection – homemade cakes always get respect. Because, who doesn’t love cake? As well as clearly illustrated instructions on baking techniques, Cake Love includes a wide range of recipes for all kinds of cakes from the familiar (Chocolate Pound Cake) to the innovative (Sassy, flavored with orange, mango and cayenne-pepper), frostings, glazes and fillings, and tips on how to assemble and decorate the finished cake. The cakes here are all about flavor and texture, not about being fancy, and are meant to be made with love and eaten with gusto. Because, who doesn’t love cake?